Born in 1936, at a camp near Inukjuak. At 25, Thomassie Echalook began carving as a way of earning money while living at an outpost camp. 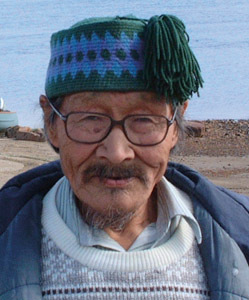 His family moved into Inukjuak in 1963. Although he began as a carver, he also made prints for several years, after attending a workshop in Puvirnituq in 1972 with his nephew, Noah Echalook. Upon their return, they transformed an abandoned portable classroom into a print studio, which was eventually moved to the co-op in 1975. Thomassie was the manager of the print studio until it closed in 1976. Probably familial; Echalook’s father, Lucassie Echalook, is a carver, and his nephew, Noah Echalook, is a well-known carver and printmaker. About Echalook’s prints, Virginia J. Watt said: “The interest in Inuit prints lies more with the subject rather than the technical skills of the printer. Not so with Thomassie Echalook . . . [his prints] show remarkable discipline and control of line” (Watt 1976:5). after his prints were published in the 1972 Arctic Quebec Print Collection catalogue. 1975 “Another Reality,” Arctic Quebec Print Collection. Montreal: La Fédération des Coopératives du Nouveau-Québec. 1976 Preface to Inoucdjouac Print Collection. Montreal: La Fédération des Coopératives du Nouveau-Québec.